On Monday, March 25, there was a hearing on several pretrial motions in the upcoming retrial of George Thomas for the torture-murders of Channon Christian and Christopher Newsom. Judge Walter Kurtz made several rulings that the victims' families did not like. Thomas' attorneys requested that some photos of the victims be excluded. The judge "ruled to exclude some of the photos." "Why would the jury not be allowed to see evidence of what they did to our kids and if it's too gruesome then that just goes to the character of how evil these people are," Channon Christian's mother Deena said. "It will be a brand new trial, but it won't be a fair trial and I am really upset about what happened today. There's no justice left for the victim's families or the victims at all," said Christopher Newsom's mother, Mary. Judge Kurtz did allow a statement from Thomas to a detective. The judge said the jury could decide on its relevance. A detective said Thomas told him, "F*** that white girl. She didn't mean anything to me." Assistant District Attorney Leland Price said, "Your honor, that shows why he would get involved." The judge also ruled the victims families could wear buttons with images of the victims only if they sat away from the jurors and behind Thomas. This ruling caused the victims' families to walk out of the courtroom. In all of the previous trials, the families have worn the buttons while sitting behind the prosecution table and near the jury. Judge Kurtz said he did not want certain images of the victims to pose a threat of biasing the jury. George Thomas was not in the courtroom for the hearing. For the last six years, Thomas' attorneys have seemingly tried to keep him out of sight whenever possible. Phil Spector prison booking photo. This is how Spector really looks. "how did the prosecution deal with the bloodless white dinner jacket in the second Phil Spector trial"
Do you see how this film twists the facts regarding the evidence presented at both trials? There was backspatter found on the front of Spector's jacket. There was also a tiny spot of backspatter that was found on the edge fold of the end of the right jacket sleeve, indicating that fold was pointed directly at the source of the spatter. During the first and second trial, the defense tried to tell the jury that if Spector had been in the vicinity of when Lana Clarkson was shot through the mouth, his white jacket would have been covered in blood. The truth is, bloodstain analysis experts testified that backspatter from a high velocity event (gunshot wound) does not travel very far at all. Backspatter droplets will be tiny, mist like. And because of their size, they rarely travel more than 2-3 feet from the source (injury). Sprocket. UPDATE: 3/26 Corrected link to Harriet Ryan's article. I had hoped to get this post up last week, but alas, real life responsibilities to Mr. Sprocket’s business kept me from writing. HBO’s Spector movie aired Sunday, March 24th, 2013. My apologies. Sprocket. It began over a week and a half ago. 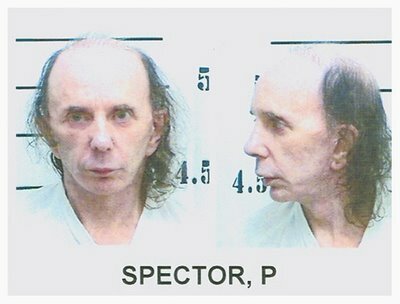 It seemed like every other email, tweet and Facebook posting I received, was about the upcoming release of David Mamet’s Phil Spector movie on HBO. Sprocket! Did you hear about the movie? Rachelle is going to be on CNN’s Piers Morgan! Are you going to see the movie? Did you see Rachelle? What do you think? You have to write about it and tell the truth. The film totally trashes Lana. Lana being Lana Clarkson, the tall, strikingly stunning woman who was murdered in Spector’s mansion in the early morning hours of February 3rd, 2003. She had been shot through the mouth while sitting in a foyer chair, her purse on her shoulder, waiting to be driven home. Spector was convicted of second degree murder on April 13th, 2009. He is serving 19 years to life. Some people consider me an authority on the Phil Spector case because I'm the only journalist who attended most of the first trial and every single day of the second. It's the case that launched T&T and started me on my journey of attending murder trials and writing about them. For me, the movie is old news. I’ve known about the HBO film since it was announced that Al Pacino would play Spector back in October 2010. That’s how long it’s been. I first reported on Mamet's film when it was announced that Bette Midler had joined the cast. Midler had to drop out six days into filming due to an injury and Helen Mirren took over the role of defense attorney Linda Kenney Baden. As you can see, Mamet’s film has been in production for a long time. Since the film was announced, I covered two first degree murder trials, Casey Anthony was acquitted of murder and Los Angeles County elected a new District Attorney. Mamet has given interviews discussing the focus of his film as far back as June 2011. I wrote about Mamet’s comments that he gave in a Slate.com article not long after that. Although there are archival clips of other people in the documentary, Jayanti interviewed a single subject for his film, Spector --which begs the question, how objective could Jayanti’s ‘documentary’ be? Jayanti spent several months with Spector, much of it during the first trial. Jayanti would come into court and hug Spector in the gallery. Everyone who was there saw the public displays of affection. It was all part of the “show” if you ask me. Jayanti was courting Spector, even during his murder trial. So, if you can keep all that in context --that the film is not based on any of the facts presented at the trial-- then tune in to watch Al Pacino give an over the top performance as the maniacal Spector, and Helen Mirren in the role of sickly, mothering defense attorney, Linda Kenney Baden. I can’t write a piece about Spector without mentioning his gold lamme-clad supporter and spouse. Phil Spector’s trial bride (Rachelle) recently appeared on CNN’s Piers Morgan talking about the film. From what I read on Gary and Louis Spector’s Facebook pages, she was not invited to the start-studded premiere (although former prosecutor Alan Jackson was). According to Rachelle, the trial bride and Spector were not consulted for the film. As far as catching the Morgan show, I saw enough of the convicted murderer and the ‘screech she tries to pass as singing’ misses during two trials to last me ten lifetimes, which is why I took a pass on watching. Back when I first heard about the film I thought for certain I’d watch it, just to see what Mamet would do with his limited knowledge of the trial that convicted Spector. But as more information came out about the film (Linda Kenney Baden inaccurately presented as Spector's lead attorney, Lana Clarkson’s character trashed, etc.) I decided it wasn’t worth my time. Alan Jackson, who prosecuted both cases appeared on CNN 7AM weekend show on March 16th to talk about the overwhelming evidence that convicted Spector. Unfortunately, I missed seeing Alan talk about the case of his career. The LA Times’ Harriet Ryan wrote a very good piece on the film. During the first trial, Ryan worked for CourtTV and was in the courtroom every day that I was there. She knows exactly what evidence was presented at trial. She dropped in on the second trial a little over a dozen times. All I can say now is, I’m glad it’s finally aired and reviews about the film are informing people about the incredible amount of creative license Mamet took in telling this story. If you would like to know more about the film, here are a list of reviews. As my readers know, the Rasmussen family's lawsuit against the LAPD ended on February 20th, when the California Supreme Court declined to take up the family's appeal. The California Courts of Appeal had rejected the Rasmussen's lawsuit in November 2012, on the grounds that the statute of limitations had expired. Thankfully, there is no statute of limitations on crimes against journalism, so I've decided to revisit this series. Mark Bowden’s article on the Stephanie Lazarus case ran in the July 2012 issue of Vanity Fair. The first time I read Bowden's article, something immediately struck me as off. I began writing about it a few weeks later, pointing out a number of factual mistakes in Bowden's piece. I also pointed out a number of places in the article where Bowden's quotes did not match the official court transcript of Stephanie's 2009 pre-arrest interview. It was one of Bowden's misquotes that initially inspired me to fact-check the rest of the article. Vanity Fair did not respond or make any corrections. After Poynter’s story ran, Vanity Fair quietly made some corrections to the online version of Bowden’s article but left many others uncorrected. To date, Vanity Fair has refused to run any correction in the print magazine. Last October, I contacted Cullen Murphy via email and tried to engage him. Murphy would not speak with me on the record about Bowden's article. I expressed my interest in communicating with Bowden via email. I made it clear that I was very interested to hear from Bowden, but it would need to be on the record. Through all of this, Bowden has been curiously silent. 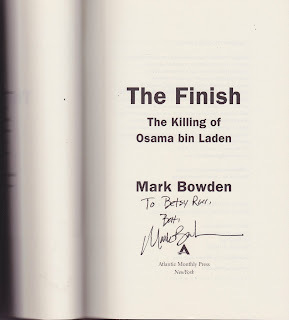 Until recently, I'd never met Mark Bowden. For the record, I have nothing against him personally. I think he's an amazing storyteller. He's also a professor of journalism. I thought I would try to contact him directly. I’m sorry I haven’t written you sooner. I only recently learned your email address. I understand you were interested in having a conversation with me. Was there something specific you wanted to ask or tell me? When I didn’t hear back, I thought maybe I had his address wrong. So I wrote him again on November 5th, this time cc’ing Cullen Murphy, whose email address I did have. I emailed you on October 25th (see below). In case you missed it or I had your address wrong, I am cc-ing your editor at Vanity Fair, Cullen Murphy, who I corresponded with last month. I’m disappointed I’ve not heard back from you. Was there something specific you wanted to tell me? 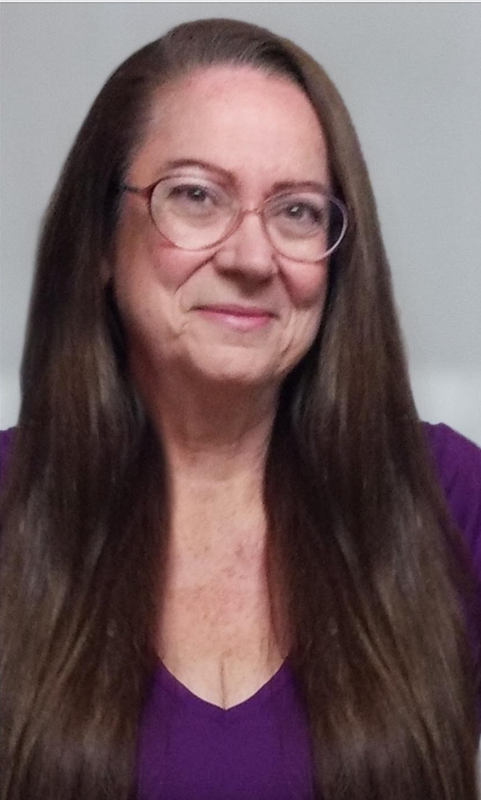 Is there anything at all you would like to say to my readers? I hope to include your perspective in my next post. If you respond by Tuesday evening, I will publish your response in full. 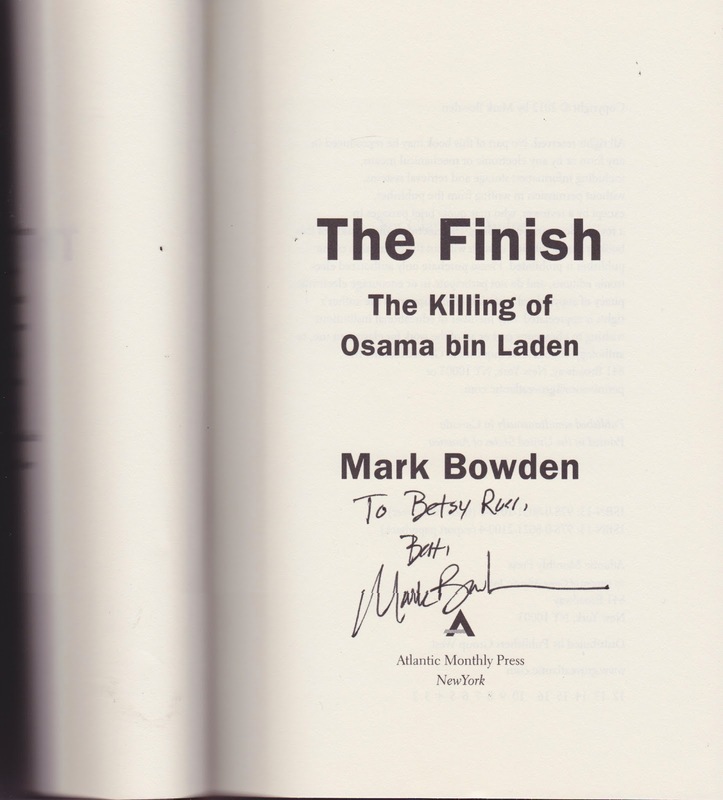 A week later I learned that Bowden's book tour for his latest book, The Finish, included a stop at Vroman’s Bookstore in Pasadena on November 17th. I thought I would take the opportunity to introduce myself to Bowden and see if he would engage me and hopefully speak on the record. I've always loved going to Vroman's, a literary landmark that’s been in business for 118 years. I’ve been there many times to meet authors and get books signed. I marked the date on my calendar. 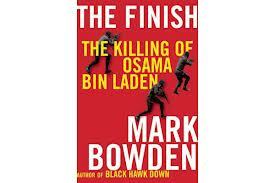 That Saturday afternoon I arrived early at the bookstore and bought a copy of The Finish. Not knowing how Bowden would react when I introduced myself, I took a friend for moral support. I climbed the stairs to the lecture area and took a seat in the back row. I got comfortable and waited for the lecture to begin. Bowden's smile immediately left his face when I introduced myself. “Oh... hi,” he replied. I reminded Bowden that I had sent him some emails. Bowden confirmed that he had received them by telling me, “Well, you asked if I had any questions of you, and I don’t.” He then added: “But if you had any questions for me." I asked him if he would answer an email. Bowden was non-committal. There were people waiting in line behind me, so I thanked Bowden and handed him my book. I enjoyed listening to you speak at Vroman’s Bookstore in Pasadena yesterday, as well as meeting you in person. During our brief conversation, you said you had not replied to my earlier emails because you didn’t have questions for me. You then asked if I had any questions for you. I have several questions about your article on the Stephanie Lazarus case. "The central charge made by T&T is that Mark Bowden does not accurately quote the interrogation of Stephanie Lazarus and in one instance even adds his own material. This is false... The author of the T&T post relied on a transcript of the interrogation. Bowden, rather than use some unknown person’s transcript—transcripts are notoriously unreliable—went to the actual videos of the interrogation to confirm his quotations. Further, to make sure the speakers were being identified correctly, the quotations were read back to Detectives Stearns and Jaramillo of the LAPD. When the article was published, Vanity Fair put the videos online to make the source readily available. On review, we confirmed that Bowden’s quotations are indeed accurate and that the transcript is not. (We did find that two sentences in a single quotation in the VF piece had been inadvertently transposed, with no impact on meaning.)" I don’t understand how such a detailed statement could be made inadvertently. Did you provide the information for Murphy’s initial statement? To your knowledge, is any part of Murphy’s initial statement true? Are you aware that there are additional quotes you attribute to Stephanie Lazarus and Detectives Jaramillo and Stearns that do not match the video and official transcript? The official transcript I’m referring to was released to the public in November 2010, eighteen months before your article hit newsstands. Can you explain how these inaccurate quotes came to be published? As a journalist, do you still stand behind your account of the interview? Thank you for signing my book and I hope to hear from you soon. If you respond by next Sunday (November 25th), I will include your full response in my next post. I'm still waiting to hear from Bowden. Over on my sewing blog, I'm having the biggest Hot/Cold Pack sale ever. Check out the sale to see why these are the best Hot/Cold Packs you can buy anywhere. Short Synopsis: Prosecutors allege Park strangled Redding to death in her Santa Monica apartment on March 15th or 16th, 2008. It's 8:57 am when I finally get inside Dept 109. I knew Judge Kathleen Kennedy rarely takes the bench before 9:00 am but I wasn't expecting the gallery to be this full. I take a seat in the third row on the end near the door. At first I think the packed house is because of the deliberating jury in the Bell City Counsel corruption scandal but I'm wrong. The second row is filled with victim Juliana Redding's family and friends. Redding's parents, Greg and Patricia Redding are sitting directly in front of me. Kelly Soo Park and Tom Chronister (reportedly recently married) along with many of Park's supporters are jammed into the third and fourth gallery rows. Over on the far right in the second row is the other blogger, Lonce LaMon. Behind me are Lisa Tomaselli from ABC's 20/20 and NBC Dateline's Luz Villarreal (who I first met at the James Fayed trial). I was late getting started and chose to drive into downtown today instead of taking the train. I'm not even sure I can properly follow the proceedings today. When I came down with a severe upper respiratory infection I missed two hearings and I don't feel prepared. DDA Stacy Okun-Wiese is at the prosecution table with a gray haired DDA I've never seen before. As I squint to see what Stacy is wearing today (gray suit with patterned stockings) I note the harsh fluorescent courtroom lighting washes out her auburn hair. Behind Okun-Wiese is the slender Asian attorney for the City of Santa Monica. To my left is a pretty, dark-haired young clerk that I believe is with the DA's office. She's sharply dressed in an all black pantsuit wearing black framed glasses. Not long after I sat down she moved to the other side of the aisle, often called the 'defense side' and chats up a sharply dressed gentleman. I note that Judge Kennedy's bailiff is still 'Sean' (sp?) and Lori (sp?) is still her clerk. As we wait, deliberating jurors continue to file by us and disappear into the jury room. George Beuhler and Mark Kassabian are not at the defense table, but in two chairs directly behind the table, back up against the wall separating the well from the gallery and directly beside the bailiff's desk. A group of older robust, suited gentlemen enter and congregate around the chairs by the inner doors. I'm making a guess that these are probably attorneys for the Bell City Counsel defendants. More jurors file in. Judge Kennedy steps out from her chambers and is speaking to her clerk. She's wearing a black scoop necked top with a silver and black cardigan, buttoned up. Is it possible she's lost even more weight? Way to go Judge Kennedy. The bailiff addresses the room to ensure that every one's cell phone is turned off. I remembered to turn mine off in the hallway. A defendant is brought out in a bright jail orange jumpsuit and at 9:06 am, Judge Kennedy takes the bench. Judge Kennedy calls the case, People v. Pedrosa, (sp?) and asks counsel to state for the record. The gray haired DDA sitting next to Okun-Wiese stands for the people. There's a 1050 motion in the Pedrosa case. And then Kelly Soo Park is called. Park gets up from her seat in the back row to join her counsel at the defense table. I can see what she's wearing for the first time. Black pants, a white blouse and the familiar hip length camel jacket. Judge Kennedy states she wants to deal with the Pitchess motion first. I'm guessing this is where the defense believes they should be allowed to see documents from the City of Santa Monica and Santa Monica has been objecting to this request. Judge Kennedy rules, "I'm inclined to go in camera with the city attorney [and the custodian of records? to] review documents and see... ... The law under Pitchess has gotten so liberal ... I think the defense has met it's burden." For the record, Judge Kennedy states that her court reporter and the named parties will go in chambers for her to review the documents in camera. At 9:11 am, Judge Kennedy is back on the bench and on the record. Judge Kennedy rules that, "There are no records that fall within what the defense was seeking." So, nothing falls within the Pitchess motion. Judge Kennedy orders the court reporter that the transcripts for the in camera meeting are not to be transcribed. The Santa Monica attorney and the custodian of the records are excused. The next issue that is litigated is the people's 1101b motion. Judge Kennedy states she has reviewed the prosecution's motion, the defense rebuttal motion and the people's response to the rebuttal motion. Unfortunately, I only have the initial motion, and not any of the others. I'm betting that Judge Kennedy has already made up her mind and these oral arguments are just a formality. Okun-Wiese reads from the appellate ruling on People v. Spector as to the admissibility of 1101b evidence. She adds that the defense motion calls for there to be a nexus link between the witnesses and acts charged. "The defense position is that Dr. Uwaydah pulled out of the deal first. ... But the defense motion did not include the letter[s] from Greg Redding's attorney and Dr. Uwaydah's attorney." Kelly Soo Park is turned towards Okun-Wiese and appears to be intently listening to her arguments. Buehler then argues the defense position. "First, it's all speculative that Dr. Uwaydah had any desire to retaliate against [Redding]. ... [Regarding] Jerry Lukiewski, I'm not aware of anybody, Kelly Soo Park or anyone else, did any threat or anything [threating] towards Mr. Lukiewski. ... The prosecution has a gap in it's evidence and want to take some conversations with Mr. Lukiewski and apply it to this case." Judge Kennedy fidgets a bit on the bench. Buehler continues to argue that there are no similarities in these alleged prior incidents and this case. "In Spector, you had seven prior incidents where Spector pulled a gun. ... If prior uncharged acts are allowed in, then we should be allowed to all the evidence relating to the Jerry Lukiewski issue and Dr. Uwaydah. ... we're entitled to. ... So we should get all the evidence. ... The Aaron Kelly matter involves an alleged incident in 2006 .... doesn't involve Dr. Uwaydah but Kelly Soo Park. ... So, at minimum, we would be entitled to that evidence and the time to review it. ... I think that opens up [to the defense] all the evidence the people have in the Dr. Uwaydah matter. ... I think the people are way off base. .. I don't think the people should be able to bring this in ... in order to fill a hole. ... That's not appropriate." It looks to me like Judge Kennedy is patiently waiting for Buehler to finish. Okun-Wiese then argues one more time. She mentions that the initial falling out of the business agreement was initiated via a letter from Mr. Redding to Dr. Uwaydah, calling him out on illegal activities. Okun-Wiese continues arguing the facts of the Lukiewski issue and the actions of Ronnie Case. Okun-Wiese tells the court that all the evidence regarding the Lukiewski matter has been turned over to the defense. "The only link between the defendant and Juliana Redding is Dr. Uwaydah. ... The reason there wasn't another incident [Lukiewski]... Santa Monica Police arrested the defendant before she could get to him." Judge Kennedy finally rules. "I don't think the people have met their burden." She adds however, that may change if (the defendant? defense witnesses?) testify or present evidence. "It seems clear to me the people have not met their burden. ... The only other issue is renewal of the wiretap. ... The Hobbs* material did not change anything about the wire tap and that issue continues to be denied." Judge Kennedy mentions that she has another subpoena. The defense states that it's theirs and asks that it be turned over. The prosecution has no objection. Then Judge Kennedy speaks to the room about how disappointed she is that this case is still not ready to go to trial at the prior date they discussed. "I don't know what shenanigans or foot dragging [the defense] has done..." Buehler responds, "There has been no shenanigans..."
Buehler explains that another case in Federal court has delayed this case. That case is going longer than originally scheduled. Buehler adds that the defense DNA testing reports have not come in yet. In a very angry and irritated tone, Judge Kennedy tells the defense she doesn't understand 'why' the defense waited until this late date to test the DNA. Buehler tries to explain that earlier they were trying to get a handle on the case and were doing a lot of investigation. It seems to me like Judge Kennedy is getting more angry just listening to the defense excuses. Judge Kennedy tells the defense that their client changed counsel, and that's her right but that's not an excuse to delay. Buehler wants to push the case back to April. Okun-Wiese tells Judge Kennedy she has many witnesses she's subpoenaed. (I think she mentioned something like 65 witnesses.) She tells Judge Kennedy that the victim's family is in court today. In an accusatory voice Judge Kennedy tells Buehler, "I think you did this intentionally!" Okun-Wiese offers to the court, "I was told the DNA reports would be in tomorrow. ... When Mr. Buehler and Kassabian took over the case, they said [regarding] the DNA ... they were not going in that direction." Buehler is in trial across the street. (On Monday, I was in the Federal Courthouse, checking on something for a friend and had lunch there. I happened to see George Buehler in the fourth floor cafeteria around lunch time.) Judge Kennedy blasts Buehler again. "You have come in [here] repeatedly [stating] you're ill ... another trial ... DNA! ... I want this case to go to trial! ... [The defendant] changed lawyers three times! ... I don't think you ever wanted the case to go to trial." It's obvious Judge Kennedy is angry, but it's just yelling, nothing more. She doesn't lay any sanctions on the defense. Okun-Wiese tells the court that their DNA expert is out of state from April 25th to May 10th. "The DNA is my case," she adds. Judge Kennedy understand that the people are not willing to start their case without their star witness and asks her how soon she can start. After a bit of back and forth and clearance with the clerk, Monday, May 13th is selected. The case clock is set at zero of 10 on that date. Jury selection will start on that date. Judge Kennedy asks about pre-screened jurors. If they do pre-screened jurors, May 13th is a firm date. And that's it. Judge Kennedy is off the bench. The bailiff goes over to the victim's family and explains the issue of limited seating during jury selection. Another friend of the victim's family arrives late to court and many hugs are exchanged. The court clerk calls the attorneys back to her desk before they try to leave. I clearly hear Lori tell counsel, "You can't change this date because the jury will be here." When everyone slowly files out of the courtroom, a few in the media try to hand their cards to friends of the family but no one will take them. Out in the elevator bay, it's a long wait for an elevator going down. I try to stand back and give the family their privacy. Juliana Redding's mother, Patricia, and some of the family supporters have left the hallway and are in the elevator bay, while others are still in the hallway. Patricia, seeing her friends still in the hallway, heads back through the security exit door to speak with them. A sheriff calls out to her, Mam! Mam! You can't go back there! The sheriff tells her she had to go through the security checkpoint again, if she wants to reenter the hallway. I don't know if she heard them or ignored them. The sheriff goes up to her, grabbing her hands and placing them behind her back. I'm wondering if he's going to arrest the mother of a murder victim, but he doesn't. Holding onto her arms, he guides her back to the elevator bay. Note: This case is a DNA case. The 1101b evidence the people fought to introduce would have gone to show the jury the people's alleged position on motive, basically 'why' the victim was murdered. Although juries like to hear motive, it's not a requirement of law that the prosecution provide one. In court documents, the prosecution alleges that Park's DNA was found in many areas of the apartment as well as around Juliana Redding's neck. It's entirely possible there may be more motions filed once the defense DNA reports come in. I will periodically check with the court clerk to see if any more pretrial hearing dates have been scheduled. Sprocket. *Hobbs To me, it appears Judge Kennedy was referencing the case, People v. Hobbs (1994) 7 Cal.4th 948, 973 -- in relation to earlier defense motions to get the people's wiretap evidence ruled inadmissible. Sprocket.